Labeljoy enables you to print labels on partially used label sheets. At the end of a print job, the last label sheet is often only partially used. To avoid wasting labels, Labeljoy can start new print jobs using a partially used label sheet as the first page. You can define the start position of the printing job by entering the Define start position mode using the dedicated button on the File tab of the ribbon. Or you can go to the Print tab of the Option dialog box. 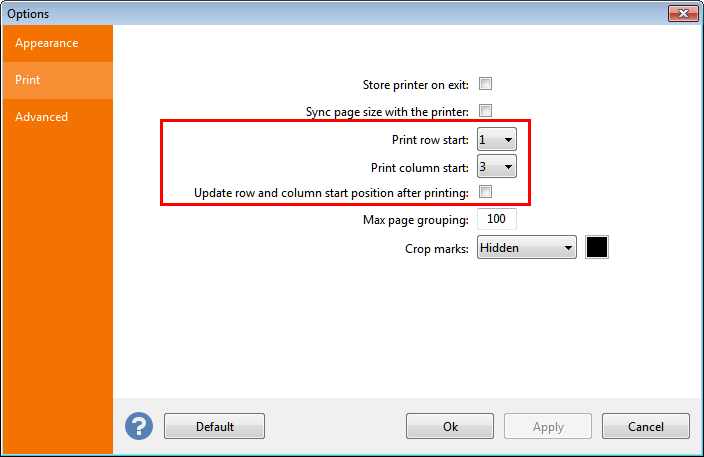 Use the Update row and column start position after printing to change the start position automatically after a print job, so that the next print job will start exactly at the first available position of the last page printed. Alternatively, you can use the mouse to set the printing start position quickly. You can do so by following these steps: Set the zoom to Whole page for ease of use. Press and hold the SHIFT, CTRL and ALT keys. Click with left mouse button on the label position you want the print job to start from. At this point, if you defined a starting position other than row 1 - column 1, Labeljoy will empty all label positions preceding the one you clicked on, offsetting all label positions toward the end.